Looking for a New Year’s Resolution that is easy to keep? How about becoming more involved with the SSHBA? Find out how you can keep this resolution by attending our 2019 New Year’s Party!! live music from “Matt, Zach & Tom”, plus food and drinks? We’re making this one easy resolution to keep….trust us! 2018 Tour of Homes Kick Off Party! 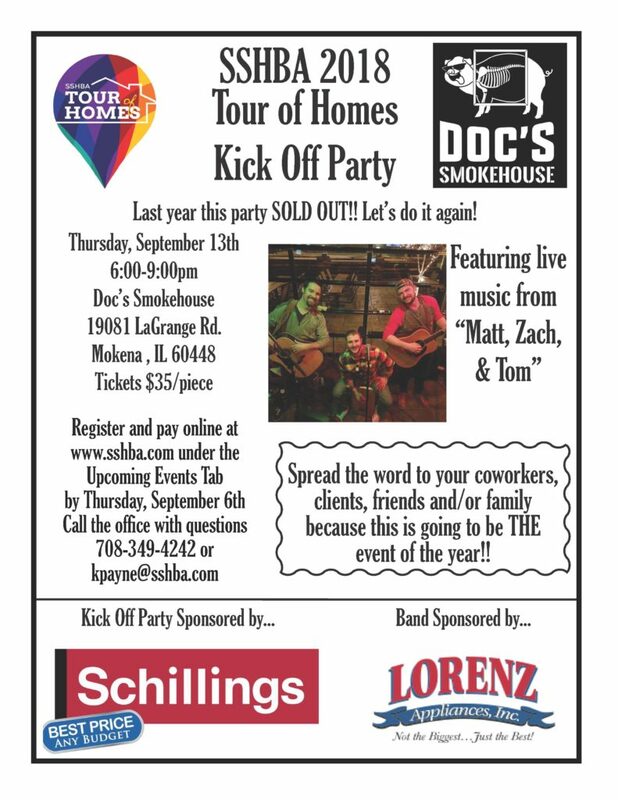 To “Kick Off” the Tour, we will be hosting another “Kick Off Party” on Thursday, September 13th at Doc’s Smokehouse in Mokena. The cost is only $35/person for food and drinks and LOTS of networking. Last year we SOLD OUT at our max 200 attendees and there was standing room only. We intend to do it again so get your RSVP in ASAP to be sure you’re on the guest list! With our new online registration system you can now register and pay online. Click on the “Upcoming Events” tab on the top of the homepage and register today! Oftentimes, as small business owners, we don’t feel as though we have a voice. We don’t have the “buying power” of a multi-national corporation or the “man power” to always analyze the best pricing on items from materials to office supplies. We don’t have a seat on the board or a place at the table when it comes to negotiation the things that matter. Big things like taxes, impact fees, cost of doing business, insurance…. Or do we? As individuals, we are largely ignored by our lawmakers, vendors and insurance regulators. As an organization, we are a force to be reckoned with and a voice that is simply too loud to be ignored. We need that. We all need that. The success of our industry rests on the ability of each of us to join together and say when enough is enough. We may not have time in our day to day to devote to the larger cause – but our SSHBA makes it a priority. Every day. Each of us benefits from this effort… we must take this momentum and move it forward. What can you do? Make the SSHBA a priority in your business. Attend a networking event, meeting or join a committee. This will benefit you in an individual way by opening up doors to new clients; taking advantage of member discounts and having a bit of fun along the way. However, it will also benefit you in a major way by increasing the presence of our industry in arenas that matter. This will result in an easier and more cost-effective way to do our business. Win-Win! So, spread the word. The incentive program is an amazing way to grow our organization, help our own businesses and even PAY for our own dues. Each person who refers a builder member who joins receives $50 off their own dues and $25 off for referring an associate member who joins. Again, Win-Win! Talk to your friends, vendors and business associates and take advantage of this offer! September 15/16 & September 22/23 – 2nd Annual Tour of Homes! Come out to support your fellow builders! I hope that you are enjoying this summer! Take the last few weeks to relax, re-charge and soak up the sunshine. I look forward to seeing all of you on August 16th!